The fireplace, just 6' from my desk, has a beautiful fire going, I'm looking out the window at snow falling, AND it is the beginning of a big snowstorm set to unfold over the next 24 hours! I'm fully prepared, in "hunkering down" mode and ready to enjoy my home, most especially, its open plan kitchen/den. ...Which makes me think about "the cozy kitchen" and how we can make the winter kitchen comfortable, cozy, and warm - a pretty delightful combination! 1. Rugs - Do you have an unheated tile floor? 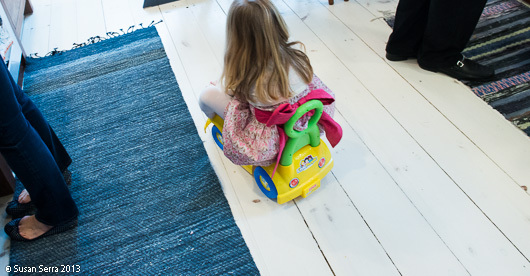 Bring in rugs with a rubber pad to hold it in place or use rug tape. Rugs "do' cozy, really well! 2. 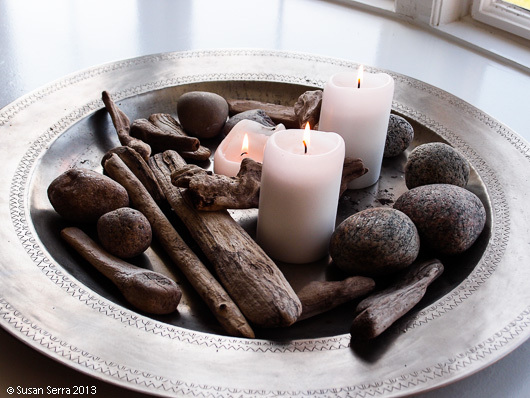 Warmth - Bring in the candles...gather small stones, twigs and pine cones from the outdoors and make a lovely arrangement on a plate. 3. 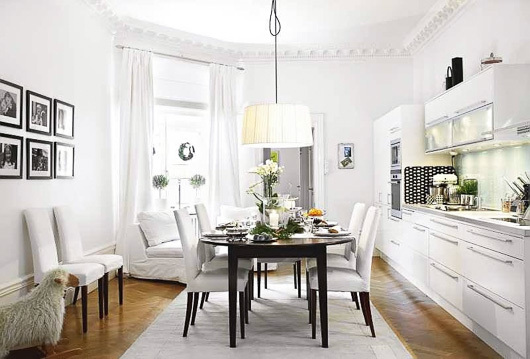 Lighting - When buying pendants or lighting fixtures, hang them low! The lower they are hung, the cozier the feeling. 4. Long Cooking - Cook dishes that require low, long, simmers, roasting, braising, etc. Crockpot dishes cooking all day enable the savory fragrance to flow throughout the home. 5. 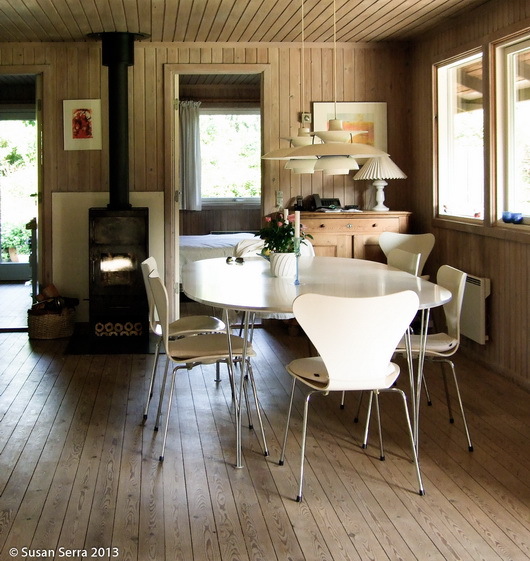 Start a Fire - Do you have a fireplace in your open plan kitchen? Start the fire in the morning and keep it going - the act of fire tending is a cozy activity. The act of flipping a switch for a gas fireplace gives instant atmosphere. Either way, it's all good! 6. Pantry Party - Stock your pantry with specialty condiments, which add a touch of something special to every day foods - truffle salt, artisan cheese, good coffees, small batch balsamic vinegar and oils are some examples. You deserve the treats, and it adds to a pleasurable cooking and dining experience. 7. 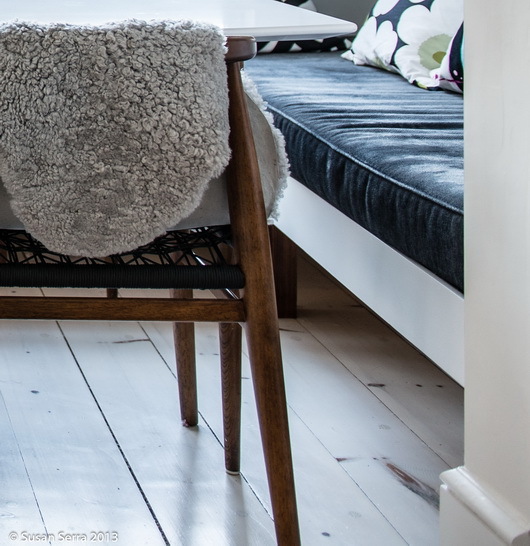 Cushion Comfort - Do your seat cushions need replacing? Replace them with super cushy cushions to encourage post-meal lingering and relaxing. 8. Bring in the living room artwork - definitely, a mantra I have repeated many times. Oil paintings, sculptures, in other words, the good stuff, has a place in the kitchen. 9. Kids Cooking - Create a small spot in the kitchen for kids' cooking equipment-just for them! 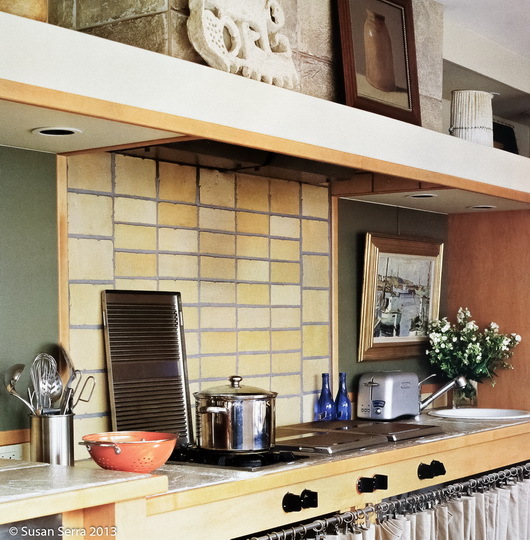 A cozy kitchen accommodates whoever is inspired to cook. 10. Change - Change your decorative layer, change the use of tableware and serveware, remove things and equipment that are not useful and periodically update the kitchen for function and aesthetics for a refreshed kitchen overall, always in tune with your current needs! The snow is really coming down now - everything is white...time to get cozy! !